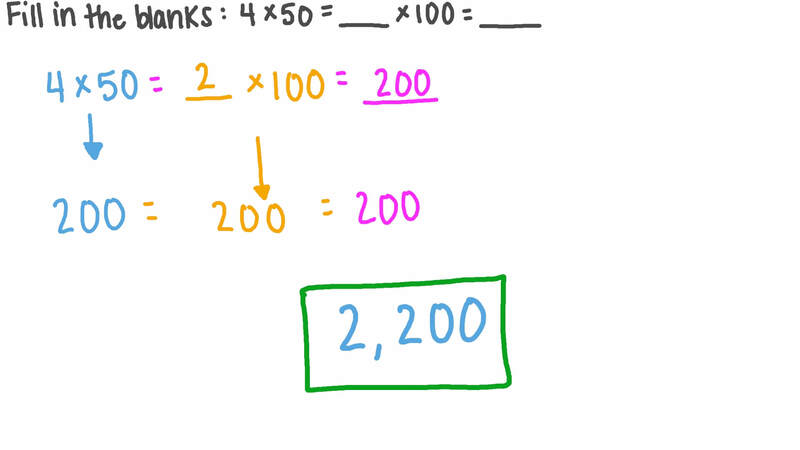 In this lesson, we will learn how to multiply multiples of 10, 100, and 1000 mentally using basic facts and patterns. Fill in the blank: 1 0 × 1 6 0 = × 1 0 0 . Fill in the blanks: 1 0 × 1 6 0 = × 1 0 0 = . 1 8 × 1 0 = t h o u s a n d s .
If a person saves 100 pounds every month, how much will they save in a year? If a train has 5 carriages, where each carriage has 100 seats, how many seats are in the train? The price of one radio is 200 pounds. Find the price of 8 radios. The average weekly profit of a shop is 1 0 0 0 p o u n d s . How much profit do they make in 99 weeks? What is 1 0 0 × 1 = ? Calculate 1 , 0 0 0 × 6 . A library contains 100 bookcases. Each bookcase has 4 shelves and each shelf contains 9 books. How many books are in the library? 9 3 × 1 0 = t e n s .
A merchant bought 8 TV sets for 4 0 0 0 p o u n d s each, and 2 radio sets for 8 0 0 p o u n d s each. Calculate how much they paid. Which of the following states the relationship between the numbers 2 2 0 0 0 and 2 2 0 0 ? A 2 2 0 0 0 is 10 times as large as 2 2 0 0 . B 2 2 0 0 is 10 less than 2 2 0 0 0 . C 2 2 0 0 0 is 10 times as small as 2 2 0 0 . D 2 2 0 0 is 10 more than 2 2 0 0 0 . Complete the following: T h r e e - p o u n d n o t e s t h r e e - p o u n d n o t e s f o u r - p o u n d n o t e s p o u n d s 1 0 + 1 0 0 + 5 0 = . Fill in the blank in 1 0 × 6 × 3 = . Which of the choices is equal to 1 0 0 × 2 ?